← Cape Town, South Africa. February 27th, 2011. Traffic was shutdown in the area of Camelback Road and 67th Avenue in Glendale Sunday afternoon because of a sinkhole. 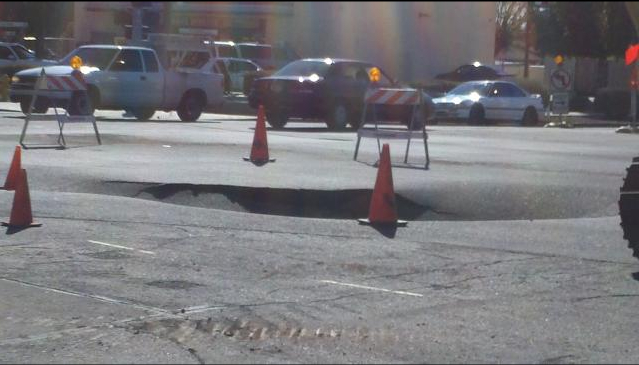 Glendale fire spokesman Daniel Valenzuela said the sinkhole is right in the middle of the intersection. Valenzuela said the fire department was called to the scene for a possible gas leak after someone reported smelling natural gas. A representative on scene with Maricopa Flood Control said a project to replace the storm sewer at the intersection was recently completed. He said excess rain along with the construction likely contributed to the trench failure. This entry was posted in Pictures and tagged Arizona, sinkhole. Bookmark the permalink.